Writing about perfume history is an acre of land strewn with minefields. 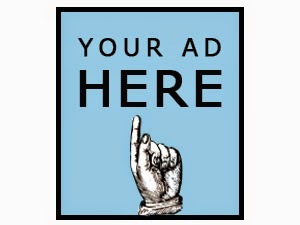 Little has survived into its original form and the industry has been ferociously shrouded in secrecy. 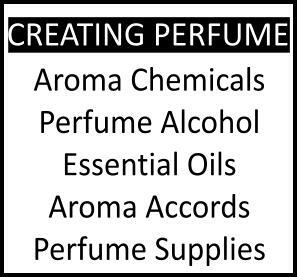 Writing about those more elusive, less known aspects, such as perfumers' bases, is even harder because it involves talking about raw materials, and raw materials that are a manufactured composite rather than a single ingredient/molecule at that. Among the most famous bases is De Laire's "Mousse de Saxe". Structure & History of Creation of "Mousse de Saxe"
The "Mousse de Saxe accord" is comprised of geranium, licorice (created with anise), isobutyl quinoline (leather notes), iodine and vanillin (synthesized vanilla). It was used since the turn of the 20th century and produced by the great aroma-producing firm of De Laire, a composite made by Marie Thérèse de Laire. Edgar de Laire's wife gave birth to the new branch of the factory dedicated to the production of aromatic compounds in 1895. Founded by chemist Georges de Laire (1836-1908), the de Laire firm quickly became a source of synthetic aroma chemicals and "perfumers' bases" (i.e. a ready-made accord of ingredients producing a specific effect, such as famously Prunol, Bouvardia, Ambré 83 and Mousse de Saxe), but also of finished fragrances such as de Laire's Cassis from 1889 or Miel Blanc. Dark, earthy, mossy bases were in production even in the late years of the 19th century, long before oakmoss and tree moss would fall under the rationing of perfumery regulatory body IFRA, and besides Mousse de Saxe there was also Mousse de Crête (Creatan moss) and Mousse de Chypre (Cypriot moss). The geographical names might hint at some inspiration coming from a material found in Prussia (most of the perfumery mosses traditionally came from the Balkans), much like the dark blue hue in painting is called Bleu de Prusse (Prussian blue) from the military uniforms of the men of the -then independent- Prussia, a counry sharing lands amongst modern day Germany and Poland (The dye was produced in the eighteenth century via sulfuric acid/indigo). Mousse de Saxe is a complex creation: It has a dark, sweetish, mossy-woody powdery aspect (indeed chypré) with green, fresh, bracing accents and a musk and leather background of "animalic" character, which is very characteristic once you experience it. 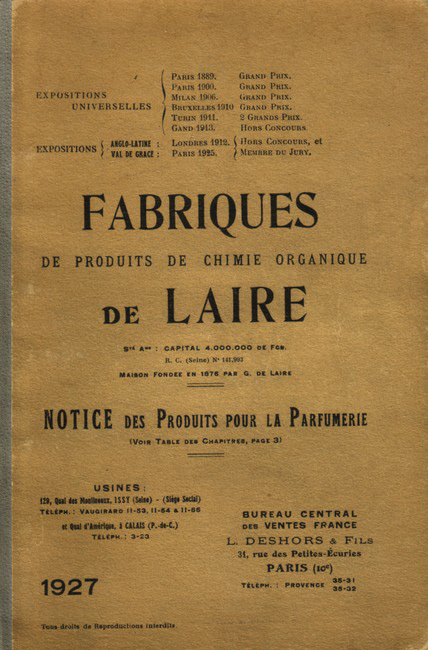 De Laire probably infused it with its own revolutionary ionone molecule (which entered in Violetta by Roger & Gallet). 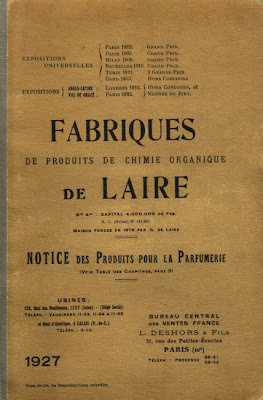 The bracing, "cutting" freshness is due to the quinolines (bitter green leathery with a hint of styrax), as De Laire was among the first to produce these novel ingredients. This base must have been a novel approach in the years of its creation and one can only imagine how perfumers of the time had received it, since perfume formulae have remained a well-kept secret for so long. 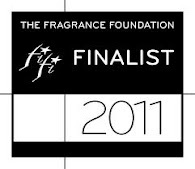 That reception must have been overwhelmingly positive nevertheless, because of its influence in perfumery in later years. 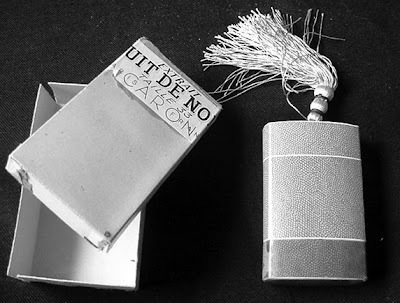 The Mousse de Saxe base is most prominent in Caron's classic Nuit de Noel (1922) but it's used in many Carons; especially the older ones composed by founder Ernest Daltroff. This accord is what gives many of the older Carons their dark undercurrent. A similar effect is reproduced in perfumes from other brands; notably acclaimed perfumer Guy Robert admits as much as using the backbone of it in his creation for Rochas, Madame Rochas and in Calèche for Hermès. Other perfumes which present a similar background note are Habanita by Molinard (which also used the Mouse de Saxe base), or the directly influenced base notes of Bois des Iles, Chanel No.19, Grès Cabochard, Shocking by Schiaparelli and YSL classic Opium. Recently the term "Mousse de Saxe" has lapsed into the public domain and now belongs to Parfumerie Générale and its perfumer Pierre Guillaume who used it in his Papyrus de Ciane press material to describe the base notes used for his modern green, mossy fragrance. Dawn Spencer Hurwitz is also doing an homage to Mousse de Saxe in her Pandora perfume. Mousse de saxe is discussed in Michael Edward's book Perfume Legends: French Feminine Fragrances. Ah, you just gave me an "Eureka!" moment! Let me see... Narcisse Noir, No. 19, Opium... check, check check! Never got around to smelling Bois des Iles but I'm quite certain I'd love it. Isn't this great? It's a dark but soft thing, very individual. And so glad it clicked with you. that is an extremely kind and generous gesture of you! Sure, who can say no? I will be mailing you.